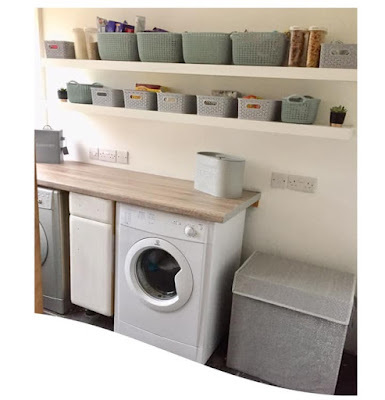 Mum of Five Staying Sane: Minecraft, it's everywhere!!. On the TV, on Youtube. The children are playing it on the Playstation, the PC and the Xbox as well as on their iPods. Me, I have no idea what's going on!! Minecraft, it's everywhere!!. On the TV, on Youtube. The children are playing it on the Playstation, the PC and the Xbox as well as on their iPods. Me, I have no idea what's going on!! Minecraft. Thing 3 is obsessed, I can cope with that. She is very busy in her little Minecraft world. Building things, making things. Creating worlds with various different houses, places to sleep. There's some cows, pigs and sheep running around and she uses various materials to create various tools etc.... However, this is as far as my Minecraft knowledge extends. Me, a 21 (plus 14) year old, cannot get my head around the whole game. If I was sat in front of it I wouldn't know how to build, create, make or live in a Minecraft world. I was raised in a world of Pacman where I had to race along gobbling up food and my only enemy was a ghost! I had the four arrow keys on the keyboard or a joystick to manoeuvre myself around and that was it. It was epic, OK back then it was epic. Now my kids look at me when I show them Pacman like I'm some kind of weirdo. 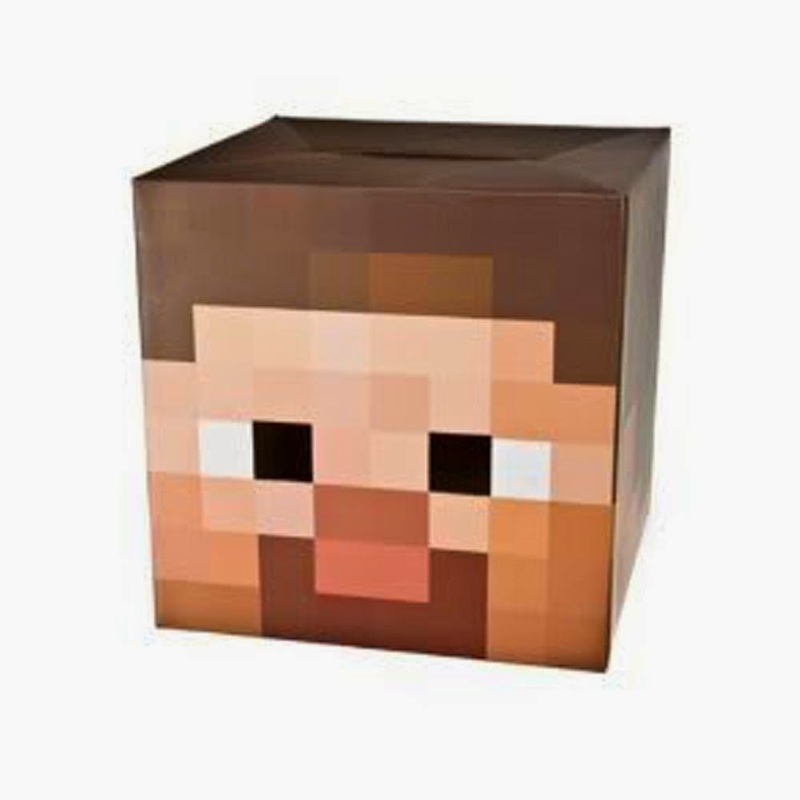 'The creative and building aspects of Minecraft allow players to build constructions out of textured cubes in a 3D world. Other activities in the game include exploration, gathering resources, crafting, and combat. Multiple game play modes are available, including survival mode where the player must acquire resources to build and maintain his or her health and hunger, a creative mode where players have unlimited resources to build, and an adventure mode where players can create custom maps or other players to play'. (information sourced from Wikipedia). Now Thing 4 has become obsessed. He too is a Minecraft whizz whether it's on the Playstation or on his iPod. He knows the names of the characters, he's off mining and creating. I sit in amazement at what he has learnt to do in this game and think that maybe I should know my way around the game! Thing 4 wants Minecraft toys for his birthday. 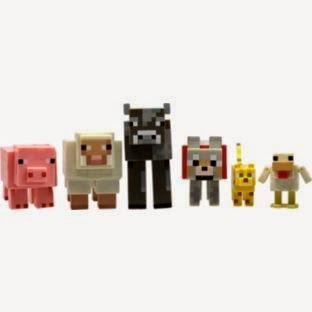 I picked up a pack of Minecraft animal figures and I was stumped as to what to buy after that. There are soft toys, toys that make noises, cardboard heads, diamond pickaxes, swords and more. I didn't realise you could buy any of these things! Thing 3 did get Minecraft Lego for Christmas last year and I have been told there is new Minecraft Lego coming out too, just incase we didn't have enough Lego already! Minecraft and Lego, it's a creative world dream come true!! As well as knowing all of the character names too, that's Thing 4 not me! All I know is there's a guy called Steve. Then there's Creeper, Enderman, Zombies, the animals and so many more besides. I can't keep up. Thing 3 is constantly going on at me about mods and texture packs and I look at her like she's talking some foreign language. These, as far as I'm led to believe, are downloadable add ons and extras to the game which we have already used for the PC version that we have. Figures state that by March 2012 it had become the 6th best selling PC game of all time and as of April 29th 2014 it had sold 15 million copies on the PC becoming THE best selling PC game of all time. As of June 2014 it had sold almost 54 million copies across all platforms and in February 2014 it reached 100 million registered users. Being an open world game and having open ended game play means players have a large amount of freedom in choosing how to play the game. Thing 3 and 4 love the freedom they have to create, change, build, rebuild etc... without the time constraints or limits of a proper game with levels, achievements etc.... There's no scoreboard, points system etc... Although there is the argument of 'my worlds better than yours' or one has more resources than the other. Whilst I try and limit their time on the computer I do love watching them create and build and they are always coming up with something new to do in their own unique world. I, on the other hand, need to brush up on my Minecraft skills. Now, how do I turn this PC on??!! Haha! This post made me go play on mindcraft for a bit! It's a great game and I spent ages building this massive castle but I lost it all! Weh! I think it's good for kids to play as it really gives them the chance to get creative! I love how creative the kiddies can be with it. I must give it a go some time but be careful not to get too addicted. I won't let the children have a go otherwise!! My girls love Minecraft....Me, I don't get it!